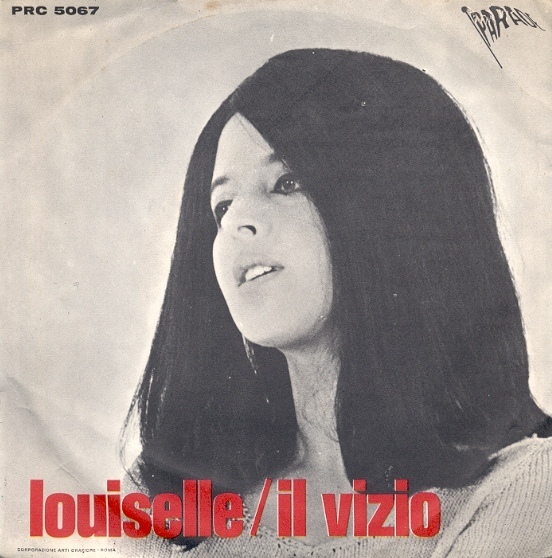 After appearing on more than a dozen 45 singles and EPs as a performer, composer, and arranger between 1959 and 1967–and the LP The Flipper’s Way as a member of The Flippers for RCA in 1960, Stefano Torossi emerged as a solo artist in 1968, releasing at least three full length albums under his own name including his first LP (and 45) for Costanza Records, an album for CAM Records featuring a pair of Torossi soundtracks from the previous year, and a soundtrack for General Music. He also did another pair of soundtracks in 1968 that were not issued in LP and appeared on at least five 45 singles in this breakout year as a recording artist. 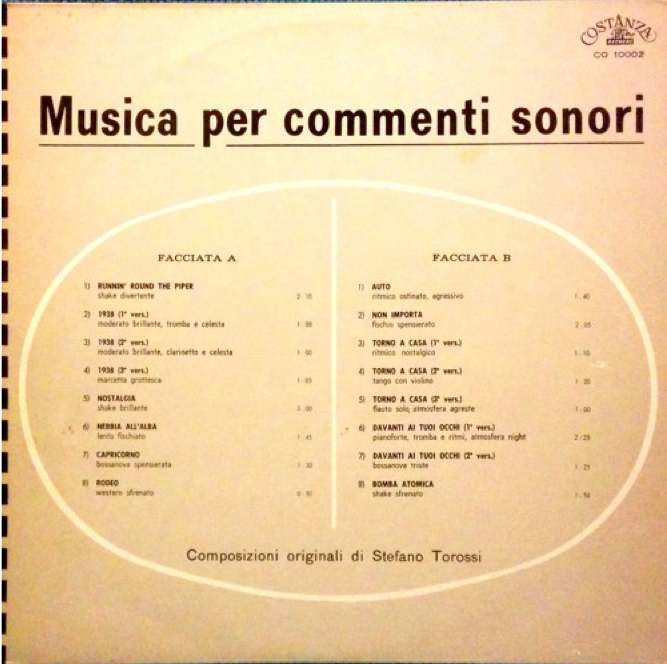 Stefano Torossi’s Musica per commenti sonori for Italy’s Costanza Records (CO 10002) features sixteen tracks including “Runnin’ Round The Piper,” “1938,” “Nostalgia,” “Nebia all’alba,” “Capricono,” “Rodeo,” “Auto,” “Non importa,” “Torno a casa,” “Davanti ai tuoi occhi,” and “Bomba atomica.” The album was the first of more than twenty Torossi released for the label in vinyl and CD from 1968 through 1999. 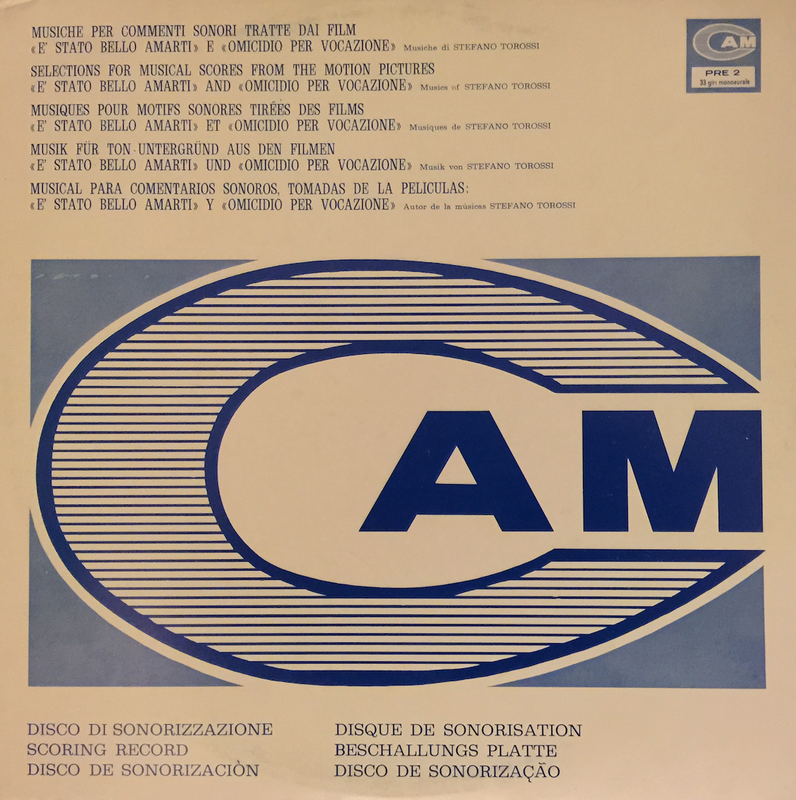 Besides debuting on Costanza, Stefano Torossi made his initial vinyl release for Italy’s CAM Records, È stato bello amarti / Omicidio per vocazione, a pair of soundtracks from films released in 1967. 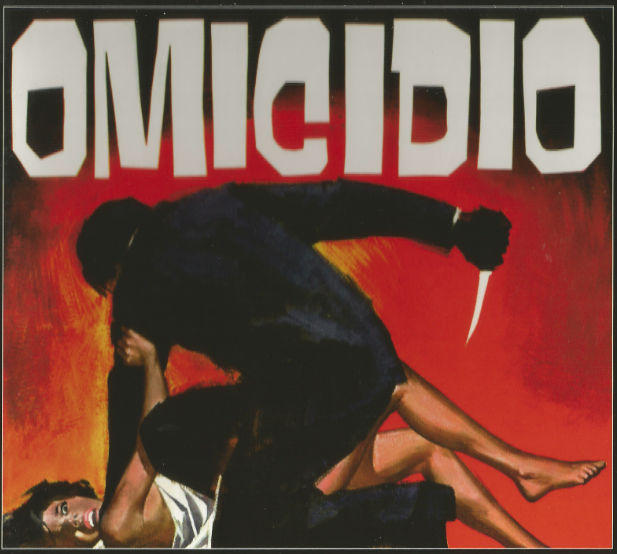 This LP, reissued in CD in 2009 by Sweden’s fin de siècle media, includes the original soundtracks Torossi composed for Adimaro Sala’s È stato bello amarti (It Was Good To Love You) and Vittorio Sindoni’s Omicidio per vocazione aka l’assassino ha le mani pulite (Deadly Inheritance). 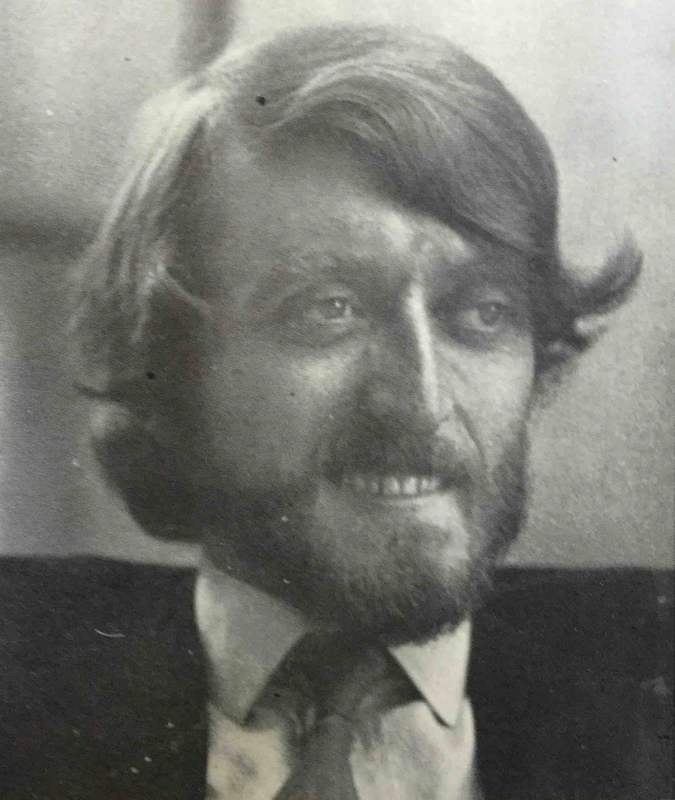 Torossi later appeared on at least five compilation LPs from CAM between 1972 and 1975 as well as a single in 1977. 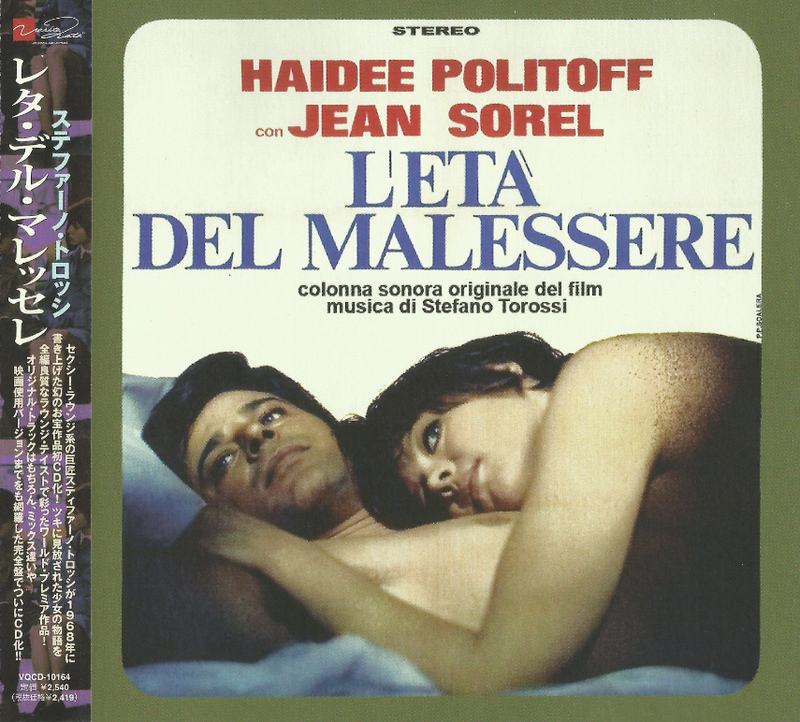 Stefano Torossi’s soundtrack for the 1968 film L’età del malessere (The Age of Malaise) was released the same year on the Italian label General Music. 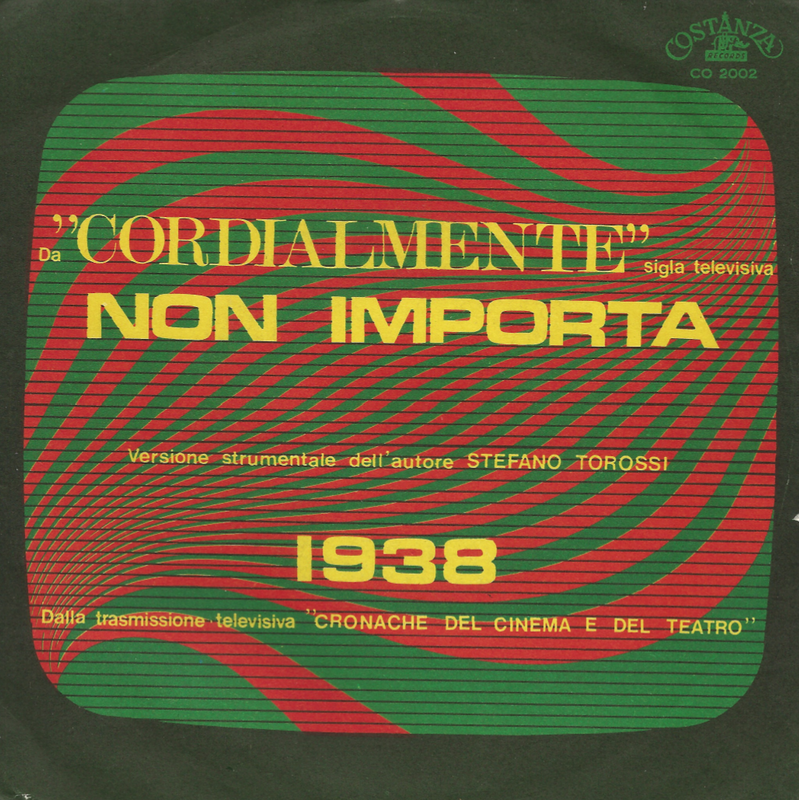 One of Torossi’s finest works for cinema, the LP includes the choir I Cantori Moderni di Alessandroni as well as the solo vocals of Edda Dell’Orso. 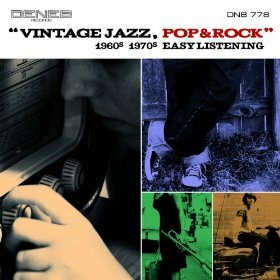 In 2010, this album was issued in CD by Japan’s Verita Note, with twenty alternate stereo mixes and film versions. 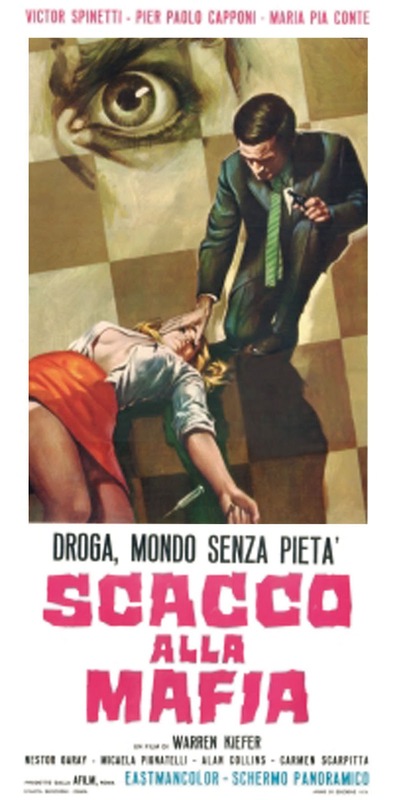 In fact, Torossi did the soundtracks for two more films released in 1968, Scacco alla mafia (Defeat of the Mafia) and Morire gratis (Dying For Free) that were never issued in vinyl. 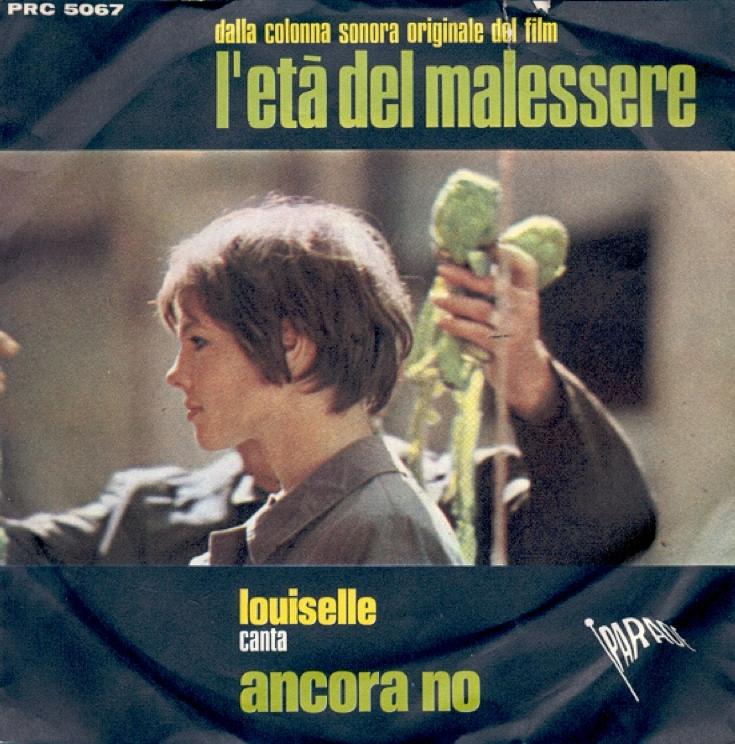 Besides the three LPs, Stefano Torossi appeared as a composer on at least five singles including Louiselle’s “Ancora no” / “Il vizio,” a 45 on Parade Records that features two more songs from Torossi’s L’età del malessere soundtrack. 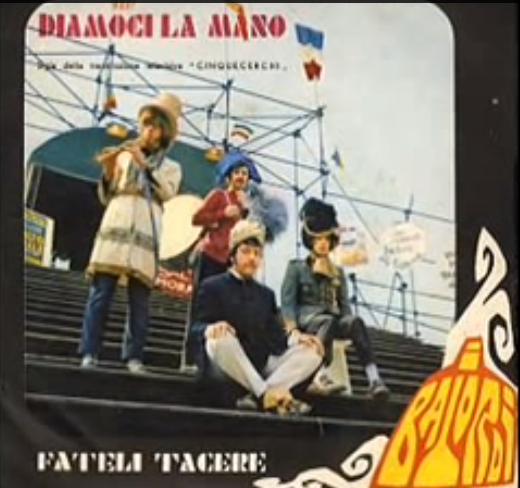 Stefano Torossi joined forces with Sergio Ricci to compose both sides of I Balordi’s 1968 single “Fateli tacere” / “Diamoci la mano” released on Carosello. 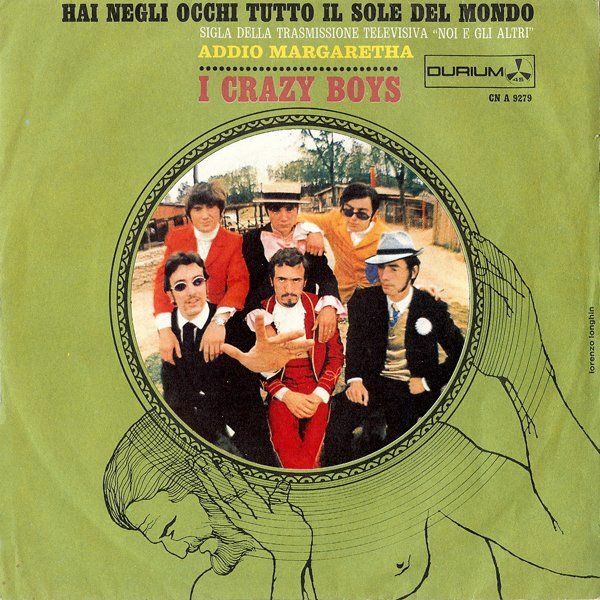 In 1974, the same legendary Italian record label would release Feelings, an album showcasing composers Sandro Brugnolini, Giancarlo Gazzani, Puccio Roelens, and Stefano Torossi. 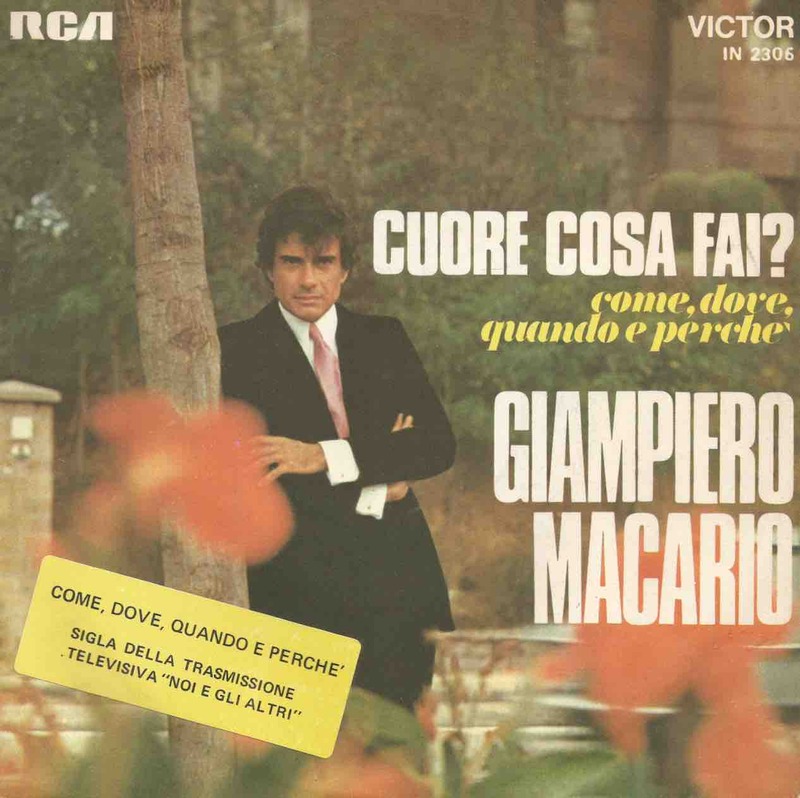 RCA released Giampiero Macario’s “Cuore cosa fai?” / “Come, dove, quando perche” single in 1968, including a B-side written by Torossi and Bruno Rasia. 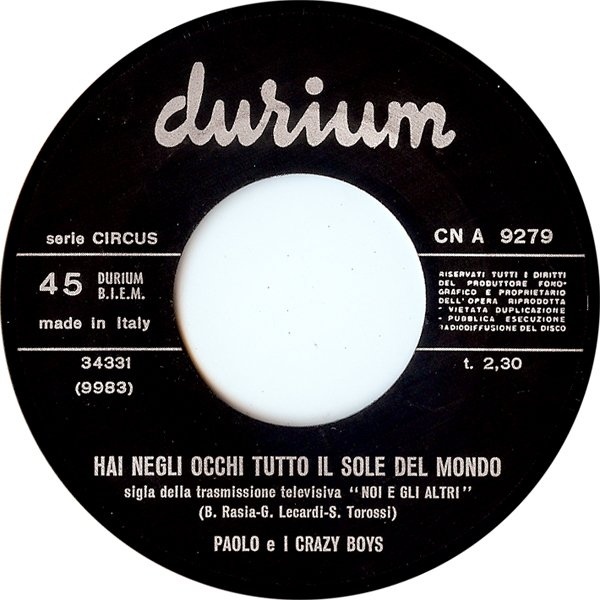 Berto Pisano did arrangements and directed the orchestra in a piece also originally used in “Noi e gli altri.” The release is one of a dozen or more RCA 45s and EPs to feature Stefano Torossi as a performer, composer, or arranger released by the famed label between 1960 and 1968. Vinyl Reissue of Echoing America in 2015? Two years later, Giovanni Tommaso and Stefano Torossi released Echoing America on Sermi Records, an eclectic mix of funk, rock, jazz, bluegrass, and more. One of this correspondent’s favorite albums, it seems a vinyl reissue may finally be in the offing in 2015. 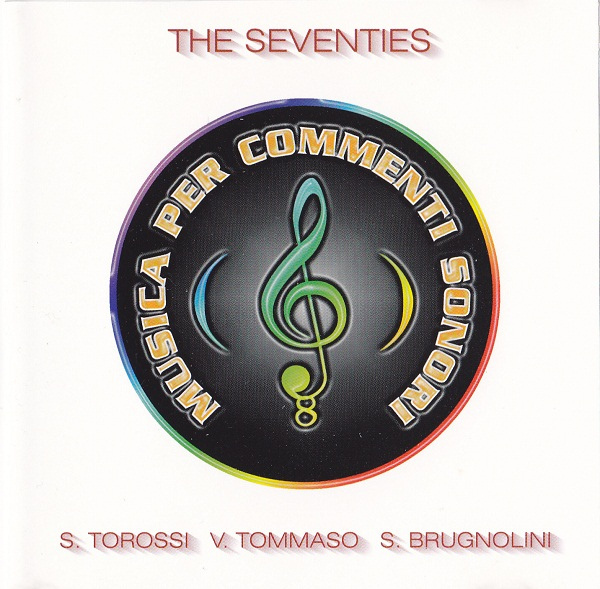 This comes on the heels of Cometa Edizioni Musicali‘s limited edition CD of the 10-track original album in 2013 which also included one unreleased bonus and two alternate tracks. 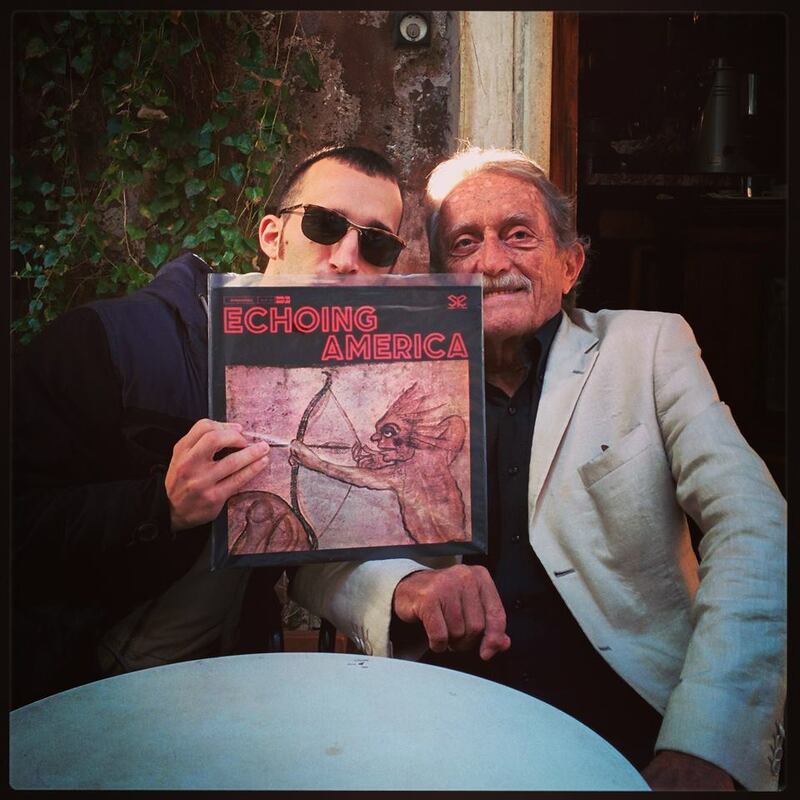 The picture below features Lorenzo of SONOR Music Editions as they discuss the possible 2015 vinyl reissue (and hopefully digital debut…) of the classic 1970 long player by the maestros Giovanni Tommaso and Stefano Torossi, both still active musically 45 years after Echoing America was initially released. This entry was posted in Stefano Torossi and tagged Armagideon Times, CAM Records, Carosello Records, Costanza Records, Deneb Records, Durium Records, General Music record label, Giampiero Macario, Giovanni Tommaso, Giovanni Tommaso and Stefano Torossi - Echoing America 1970 LP, I Balordi, I Crazy Boys, L’età del malessere 1968 OST General Music, Louiselle, Parade records, RCA records, Sermi records, Sonor Music Editions, Stefano Torossi, Stefano Torossi - È stato bello amarti - Omicidio per vocazione 1968 CAM Records, Stefano Torossi - Musica per commenti sonori 1968 LP CO 1002, The Flippers, Verita Note records. Bookmark the permalink.